Most coaches and holistic practitioners start their business because they want to do meaningful work. Can you relate? But they often don’t realize how challenging running their own business can be. When it gets challenging, especially so challenging that it shakes you at your core, who are you going to be in the face of adversity? What if there were two questions you could ask yourself that would allow you to tame even your biggest challenge? WHY are you doing this “business thing” in the first place? For most coaches and holistic practitioners, you do what you do because you received tremendous (even life-changing support) from someone who did what you are now trained to do. This is a great why! This allows you to come up with a “why” that is bigger than your own well-being. When you come up with the answer, you’ve got a powerful mission to fulfill. The bigger your mission, the bigger you become. And when you energetically become bigger, your challenge pales in comparison to your strength. A few years ago, we realized that what we do best is turn local coaches and holistic practitioners into extraordinary Transformational Leaders who are making $10,000+ per month and impacting hundreds and even thousands of people with their work. Through helping our clients, we get to positively impact the lives of millions of people. This is a BIG GAME that inspires us, so much that the many challenges that have come our way have seemed small in the face of who we’ve had to become to win this game. And the great news is that our well-being increases by fulfilling on this mission. Now it’s your turn: How will the world become a better place because of the work you do? When you have an answer that inspires you and lights you up, write it down and place it on your wall. Look at this every morning before you start your work. There is a second question to ask yourself. This one is an edgy question because it’s easy to think you’ll be able to answer this question AFTER you are making six or seven figures in your business. When things get tough, it’s important that you’re not just in business for something bigger than yourself... you’re also in business for something bigger than your clients. When your business success means you’ll be contributing to something greater than to yourself and your clients, your tough times will feel small in comparison to the people you are supporting through philanthropy. Several years ago I was at an event with our dear friend, Cynthia Kersey. She shared her vision to have every child in the world get an education. I was so moved by her photos of the mamas and babies. And disturbed by the conditions these families endure, just to get a drink of water, for example. I was moved by the idea that every child would not only get an education, but also get access to clean water (where the mamas didn’t need to spend their entire day to get water) and desperately needed medical care. She also shared that the parents would learn how to earn a sustainable income, and that the community would be taught organic farming, to make sure that everyone in the village would be clothed, fed and educated in a self-sustaining way. The thought of children starving and having no hope to get out of their circumstances is heartbreaking to me. It’s an instant guarantee of tears and a pit in my throat. By the end of that event, I stood up and declared that we would sponsor an African Village before the end of the year. I had committed to donating $25,000 without even asking Jesse! Jesse, of course, agreed and this commitment fueled us in ways we could have never imagined. And when the middle of December came, we sent Cynthia’s organization, the Unstoppable Foundation, a check for $25,000. At the time, it was a HUGE stretch to send that check. But now, when we see pictures of the new school building they built and the well, it inspires us to keep doing our business at higher and higher levels. When our boys are older, we plan to take them to this village in Kenya, so they can see the good that came from our commitment. We also have built philanthropy into our business model at the Client Attraction Summit. We recently passed the $100,000 mark in our contributions through Kiva.org. We’re just getting started. We encourage you to include philanthropy as part of your business model. When you make a commitment to have an impact in an area that is bigger than yourself, you will walk differently and talk differently and your problems will seem small in comparison with your soul-filled commitment. And when you look in the mirror, you will love who you see. We hope you've enjoyed this mini-course on how to make sure 2015 is the best year yet. We want to end this series with some serious inspiration. This will be especially powerful for you if you're feeling stuck in your business or your life. It was February of 2003...I (Jesse) was stuck in a dead end job I hated. I knew that I was supposed to help LOTS of people (just as an acorn is meant to become an oak tree). I just didn't know HOW to do it. In fact, I had tried to get coaching clients for an entire year, but I couldn't get one private client to pay me a dime. And that's why I was stuck at this dead end job. Eating a lot of cake and cookies and pizza to try to stuff down this gnawing emptiness. Until I had an awakening. It came in the unlikeliest of places... from my girlfriend (now wife) Sharla. I had watched Sharla struggle to get clients, and wasn't surprised because I knew how hard it was. But then she hired a business coach. Within three months, she filled her practice to the brim with clients. My awakening came when I realized there was nothing wrong with me... I just never learned the skill of attracting clients. In that moment, I went from feeling sorry for myself and jealous of Sharla's success to... competitive! I told myself, "If Sharla can be successful, I can too." Three months later, I got five new clients. How did I go from seriously depressed to five coaching clients and on fire? 1) I Became a Student of How to Attract Clients. I realized that I was not the first person in the world who had ever struggled to get clients, so I started to look for a mentor. I discovered that I could do it gracefully and with heart (which was SO different than what my mind told me about sales and marketing). I watched Sharla and how she attracted clients with ease. I modeled the questions she was asking potential clients. And I breathed into her confidence. And I invested in an expensive business training program. 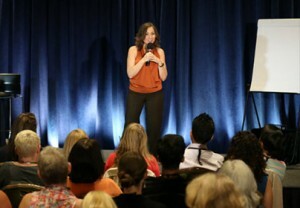 I wasn't used to paying thousands of dollars for a seminar, but I knew that I wasn't going to get results until I learned how to become a master of attracting clients. 2) I Created a Physical Reminder to Keep Me Motivated. This is a little strange, but I hung 15 postcards with pictures of animals and people all over my office. The postcards told a secret story of who I had to become and what I wanted to accomplish in one month. I looked at the postcards constantly and smiled to myself as I envisioned telling my boss that I was going to quit. I didn't tell anyone what the postcards meant to me. It was my little secret that kept me inspired and excited. 3) I Let My Dead-End Job Fuel My Hunger to Be Free. Instead of continuing to get drained by my dead-end job, I let my pain and emptiness inspire me to get out...F-A-S-T. I breathed in to my pain and allowed my pain to make me bigger, stronger, and a better coach. I got HUNGRY for change. 4) I Offered a Free Coaching Session to Nearly Everyone I Talked To. That was over 10 years ago. Since then we've taught our Heartselling**™ System to over 25,000 people. I hope you're inspired by this story. But inspiration, by itself is not enough. Inspiration fades. Commitment stays. I invite you to take this a step further than inspiration and actually write up a story about all the amazing things that are going to happen to you in 2015. Yes, that's right, write about your success before it happens. Because your mind hates change, even positive change. By writing the story of your future success, you are preparing your mind for the change that is coming next year. Here's to an epic 2015! 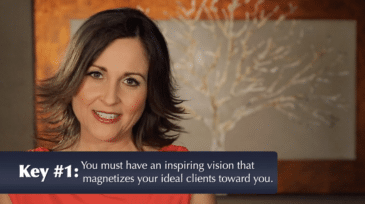 In last week's blog post, you discovered why it's important to start Visioning now for 2015 and the 3 different ways to increase your impact and income. But many coaches and holistic practitioners stop there, because they have no idea HOW to achieve their Vision to either raise their rates, attract more clients or have clients stay with them longer. In today’s article, we’ll focus on the middle strategy of attracting more clients. You're going to discover the 3 vehicles you can use to get more clients...and how to decide which one is best for you to focus on. This article can help you easily create your marketing plan so you can achieve your business Vision in 2015. Here is a question I am always asked when I am interviewed on how to get joint venture partners to promote you: "What is the most important question you should ask yourself before you approach any potential JV Partners?" The answer to this question will not only support you in being successful with JV's; it will also support you to get clear about what to focus on. My simple answer is: Get clear on your strategic objective. Ack! Did that just sound like someone with an MBA? By your "strategic objective," I mean that one action you want someone to take that will give them the opportunity to say YES to working with you. Another way of asking yourself this question is, "What is the ONE action I want someone to take… whenever I have a conversation, get interviewed, speak to a group, etc.?" 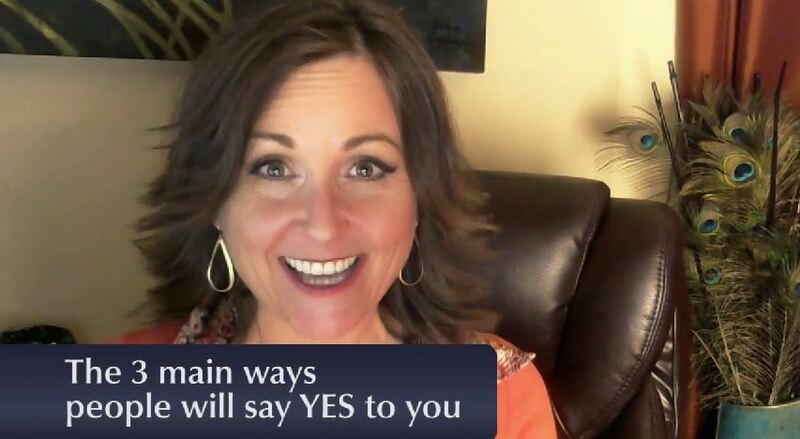 In a recent video, I shared the 3 points of conversion, which are the 3 different vehicles where a potential client might say yes to you. 3. 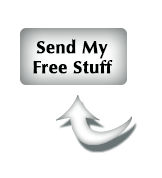 Free (or paid) live event, speaking gig or workshop. When you understand that you need to choose one of these vehicles as your main one, then you just need to consider how to get more people to join you in this vehicle you've chosen. But how do you choose which one will be your main vehicle where people say YES to you? When considering which of these vehicles to focus on, think about the experience your potential client has with you where they get the most transformation. Where do you feel confident that they will have a turning point moment, where they will mark this moment as a before and after in their life? Where do you feel confident you can shift their paradigm, so they go from believing they can't have what they want, to believing they can? This is the first step in their healing and empowerment and it should happen while they’re with you during this vehicle you're choosing. For example, we know that when people attend our Client Attraction Summit, they have a huge shift in believing they can have the success they want in their business. Some of this paradigm shift comes from the skills they learn during the Summit. And much of it comes from the life-changing experiential exercises. So we focus on offering the Client Attraction Summit in all of our marketing, because we know this is where that turning point moment happens for so many of our clients. 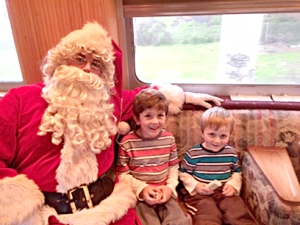 The vehicle most coaches and holistic practitioners choose is the free consultation. Because they are able to provide massive value, and offer their potential clients an opportunity to have that turning point moment, where they say YES to themselves in a big way. Now it’s your turn: Which of these is where you have the opportunity to create that turning point moment for your potential clients? Choose one. The second thing to consider when deciding which of these vehicles is to choose the vehicle that has the most impact on you. You want to make sure that the vehicle you choose fits into your personality, your lifestyle and is exciting to you. What do I love doing the most? What excites me and lights me up? Where am I most fulfilled in my interactions with clients? When you answer these questions, you can look at each of the 3 vehicles and see which one fits most into your answers. For example, Jesse and I LOVE to dance. We love to be in community. We love speaking, teaching and mentoring. And we love developing transformational exercises that people never forget. It is because of these things we love to do that our vehicle is a live event. For many coaches and holistic practitioners, they LOVE connecting deeply with one person at a time, so they might choose the vehicle of the free consultation. Others love being in front of groups, so they choose speaking or workshops. And some others prefer to stay at home in their yoga pants, and choose teleseminars or webinars. Now it’s your turn. Which of the 3 vehicles fit into what you most love to do. The next thing to consider when choosing your vehicle is which one will have the most positive impact on your bank account. So you want to consider where you are most effective (or can learn how to become highly effective) when it comes to having potential clients saying YES to working with you and are ready to invest and pay you money. Is this most likely to happen in a one-on-one consultation? A teleseminar or webinar? Or a live event where you're speaking? We know that for many coaches and holistic practitioners, the idea of asking someone to start working with you is uncomfortable. Can we offer a paradigm shift here? It may be surprising for you to know that people actually LIKE to say Yes and LIKE to invest in themselves! It’s true. At a recent Client Attraction Summit, one of our new members said that signing up for Thrive Academy Platinum was the biggest act of self-love she has ever done as she was smiling from ear to ear. This is how it feels to people when they commit to go on the journey with you! So where is this big act of self-love your new clients make (that has a positive impact on your bank account) most likely to happen? During a consultation with you? A teleseminar or webinar? Or some type of in-person speaking event? Many of our $10,000 Month Club Members focus on getting free consultations and offer a package of high-end coaching sessions during the consultations. After going through these three different levels of impact, it’s probably pretty obvious which of the 3 vehicles is going to be best for you and your business.